The Sixers came out of one of the toughest 12-game stretches you'll see on an NBA schedule at 7-5, which included a win over a Warriors team that won 16 out of 17 games over the span of a month. For most teams, that would have been enough to inspire the fans and have everyone feeling good about themselves. Is Sixers' current starting five their best line up of all time? But after a loss to the Celtics this past Tuesday, all anyone can seem to focus on is the boogeyman from Boston coming back to haunt the Sixers once again. A loss to Toronto a week prior didn't help things either, with the story remaining the same — the Sixers can't beat the best teams in the East. Naturally, the topic of conversation for a lot of this week has been Sixers head coach Brett Brown. With Philadelphia failing to get over the hump against a hated rival, one missing Kyrie Irving at that, there have been (external) questions about Brown's qualifications for the job, particularly now that the Sixers have no talent excuse to lean on. So Brown is where we'll start for this week's mailbag, because if I am nothing else, I am a man of the people. Should Brett focus more on exploiting mismatches on offense as much as Brad Stevens does when the Sixers play the Celtics? My question to you would be this: where is the mismatch that the Sixers are supposedly going to exploit in this matchup in the starting five they played the other night? With Kyrie Irving in the game, it's one thing, but they're not exactly ripe to be picked apart when Irving is out of the lineup. Marcus Smart is a great defender. Al Horford is a great defender. Jayson Tatum and Marcus Morris are good defenders, with the latter convinced he's capable of stopping LeBron freaking James. That leaves Terry Rozier, who is the smallest guy and the logical bet, but it's not a weak link in the chain the same way JJ Redick is. The Sixers did try to exploit Rozier in mismatches on Tuesday night, specifically. Philadelphia spent a decent amount of effort getting him switched onto Butler to let him go to work on Rozier in the mid-post, and the reason that's not remembered compared to what Boston did to force mismatches is because Butler settled for bad shots and didn't make them. They also got Tobias Harris ISO'd on Gordon Hayward several times, with one of those possessions being waved off for an offensive foul on Harris, a call I thought was dubious given how they officiated off-arm contact the rest of the night. Philosophically, I don't think this Sixers team is ever going to be the sort of team that just tries to force the "right" switch on every play to get the best one-on-one matchup they can. It's a ball-sharing, movement-based team, and Brown does not want things to devolve into a series of one-on-one possessions, especially now that the coaching staff is trying to get four stars to buy into a team concept together. Kyle - first time, long time listener... two part ? when is Brett Brown going to get the Sixers to actually run an offense? How can we stop the turnovers? The Sixers absolutely run an offense. And they have adapted what they do since the new guys have come on board, folding new plays into their offense in order to best suit the talent at hand. Out of 104 possessions on Tuesday, the Sixers ran pick-and-rolls on nearly a third of their plays. Jimmy Butler's preference is to be put into these plays instead of dribble handoffs, and he has been getting more and more chances to run them in recent weeks. Here's the thing — they don't always work, either. Butler picks up his dribble too early here, otherwise, the Sixers have options. Gordon Hayward has to help on Embiid with Horford and Tatum converging on the ballhandler, and that's a mismatch the Sixers will take any day of the week in the paint. But with Ben Simmons occupying the dunker's spot, Hayward can basically cover two guys at once, and that bought Horford time to switch back onto Embiid as the offense resets, eventually leading to the non-call. This is sort of my overarching problem with the conversation about Brown. I think he is generally slow to adjust (a coaching classic, FWIW) and I think they should be playing leaner/more athletic looks in their bench unit, but there are no clear-cut answers when you're building a team around a post-up big and a 6'10" point guard who can't shoot beyond six feet. But if the Sixers are running pick-and-roll sets in the final minute of a game, and doing so throughout the game with everyone down to Furkan Korkmaz serving as the ballhandler, there are adjustments being made. You may not like the results, but the Sixers are trying new things and fleshing out different concepts. As of right now, it looks like Boban Marjanovic is getting all the backup center minutes, and this is the area where I put criticism on Brown's doorstep. Jonah Bolden being taken completely out of the rotation is silly to me, especially in the matchup against Boston the other night, when there was much more to learn from playing him compared to Boban. Maybe this changes before the playoffs, but there's no reason for Boban to be a nailed-on part of the rotation. Boban is 30 years old, and the book on him is out. Teams that spread the floor and make him do anything other than stand near the rim can exploit him, which is why he has been a role player despite being a real weapon near the rim at the other end of the floor. There's near zero chance he's going to actively help the Sixers against the Celtics or any comparable team in the playoffs. So why not get Bolden minutes there? Let the kid sink or swim against a team you might see in the playoffs because we know much less about him than we do about Boban's ability to hold up. As always, a lot of this depends on context. If the Sixers go to the Conference Finals and lose in a hard fought, seven-game series? It seems unlikely they're moving on in that case. If they go out in the first round to Boston, not putting up too much of a fight along the way? Different story. 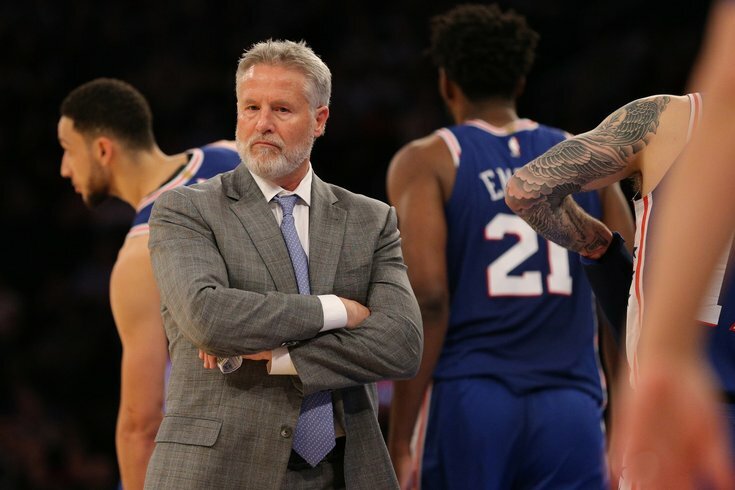 Here's something to consider — the "Fire Brett Brown!" conversation is really just chatter from fans at this point. Ownership has always held him in high regard, the players like him, and there hasn't been a single noteworthy report about his job security from the moment the team actually put some talent on the roster. Expectations have changed for everyone in the organization, certainly, but barring an ugly, early loss in the playoffs, I don't really think seeds have been planted for an ouster. Unless Elton Brand is harboring ill will that we simply haven't seen or heard about, of course. Who is the Sixers 6th most important player? It might be Mike Scott? This is a tough one. But I think Scott is the only guy on their bench who can expect his role to stay relatively consistent as the Sixers head into the playoffs. T.J. McConnell is important, but his role might change if Jimmy Butler takes backup point guard minutes in the playoffs. The big man rotation, as noted above, is a bit in flux. James Ennis and Jonathon Simmons haven't done much to impress so far, though I imagine the former will ultimately take a lot of the backup wing minutes that are being competed for right now. Scott will be in that rotation pretty much no matter what, and I wouldn't be surprised if he was part of non-traditional lineups the Sixers could turn to in the playoffs. If Brown doesn't trust Bolden and Boban is unplayable, you could see something like Butler-Redick-Harris-Scott-Simmons, or lesser versions with one of those stars (or realistically, Redick) hitting the bench. I wouldn't put money on it, but with his strength and the way the top of the East teams could look in the playoffs, he could even end up playing some small-ball center. Truthfully, probably too early to say. But since he's in the rotation and will be counted on at both ends, that's my pick for now. Is TJ McConnell gonna be a 76er next season? The Sixers prioritizing Boban over an upgrade at backup point guard suggests yes, McConnell will still be here. If they thought this was a short or long-term concern, I imagine they could have easily pushed for Patrick Beverley in the Clippers deal instead. So if we're reading the tea leaves, I say yes. He's a great culture guy, and he still has utility in certain matchups. "It really excites me to have coaches that are going to push you and not just tell you what you want to hear..."
I think this quote seemed more harmless when you actually watch/listen to him say it in context of the full quote. You listen and tell me what it seems like to you, because I think it sounds more like praise for his new coach than any shade at his old team. But I'll put it like this — if it's at all a shot at his former team, that would say a lot more about Fultz than it would about anybody in the Sixers organization. They fought for him and provided him support internally, pumped him up to the public, and gave him a starting spot that he never earned which undercut the team's best players/lineup to start the year, all in an effort to empower him while he was going through a tough time. And, by the way, the kid was given extremely generous treatment from the fans, to the credit of a Philadelphia fanbase that isn't always known for patience. If he's turning around and using that against his old team, shame on him. I don't believe that's the case, but you never know. How can Brown best utilize Butler and Harris to counter defensive strategies (like the Celtics) which are designed to contain Embiid, Simmons and JJ? I don't think this is super complicated. You can give either guy the ball and have them attack out of the pick-and-roll, and odds are it's going to be a fruitful possession for Philadelphia. Some of the Sixers' best plays on Tuesday against Boston were very basic looks with Butler and Embiid at the center of it. When Al Horford actually has to worry about an opposing ballhandler on top of worrying about Embiid, he's human just like anyone else. The trick is making him work beyond having him battle with Embiid in the post, where he's certainly up to the task. Using Embiid as a screener is another way to confuse teams. They pay him so much attention that eyes will follow him, and that can free up players like Harris for easy looks. You can't use the big fella as a screener/decoy constantly unless you want to lose his engagement level, but it's an effective counter to teams overhelping on him. Celtics seemed endlessly open for threes. Do the stats match with that, and what's the defensive breakdown? A lot of this was just a product of the Celtics attacking/hunting Redick. The Celtics ran an insane amount of their crunch-time offense through Marcus Smart on Tuesday, and he kept exploiting the athletic gap between the two players. I talked with some Sixers staffers over the last few days, though, and they seem to feel okay about their general concepts here. One suggestion I heard floated is they believed that they simply overhelped on Smart, and once the ball started to swing it didn't take long for Boston to hit an open three. There's some truth to that — if you're going to let any Celtics player try to beat you on offense, Smart is the one. With less cheating from the other players and some lineup tweaks, I think they'll be okay. Remember, the Sixers went offense/defense with Redick and Jonathon Simmons late in the fourth, and that possession produced a turnover from Boston. Sometimes, it's as simple as a personnel swap. That being said, yes, Redick is absolutely going to play down the stretch of a playoff series. I think Brown will be a little more forceful with offense/defense subs when he has the chance to, but ultimately the Sixers will want to have their two best shooters on the floor in crunch time. The Embiid/Redick plays are a pivotal part of their late-game offense, and it's still a two-way sport, after all. If having to pick between Ennis or J.Simmons for playoff minutes in a 8-9 man rotation, who gets the nod? Or do we see both playing legit minutes? I'd lean Ennis because I have some confidence he's going to shoot. My nine-man rotation would probably be Simmons-Redick-Butler-Harris-Embiid with a Bolden-Scott-McConnell-Ennis bench, and I'd swap Simmons in for one of McConnell or Ennis depending on the looks you're going to. Thinking the best path to the eastern conference finals is through the bucks which would mean staying at 4. Do you agree? There is part of me that believes this, yes. The Bucks have some exploitable pieces in a playoff series (I don't trust Brook Lopez and Nikola Mirotic to hold up defensively), and they have yet to win a playoff series as a group. In fact, the last time the Bucks won a playoff series was in 2001, when they ended up losing to the Sixers in the Eastern Conference Finals. That being said, I would caution against taking the Bucks lightly. They have been a regular-season juggernaut, and they have one of the only players in the league who can claim to be on or above Embiid's level this season. We don't have basically any evidence of what this matchup will look like — the Sixers have played just one game against the Bucks this season, and it came pre-Butler trade on the second night of a back-to-back. I don't think there's a "good" option out of this group. Let's see where things stand after another matchup with Boston and a few more against Milwaukee, because there's still a lot to be learned.